The day before Christmas, Jimmy and his best friend—his dog, Blackie—are visiting Nonna, Jimmy’s grandma, in Little Italy. Jimmy loves to visit with Nonna, especially when he can help her make biscotti. After they finish baking, Jimmy, Nonna, and Blackie set to take the freshly baked biscotti to St. Michael the Archangel Church, where they will be given to poor families on Christmas Eve. As they leave the church, a bus startles Blackie, who runs off. All too soon, Jimmy realizes that Blackie is lost. Even though Jimmy and Nonna search everywhere, the quickly falling snow covers up Blackie’s paw prints, making it impossible to follow him. Will Jimmy’s Christmas be a sad one without his best friend? 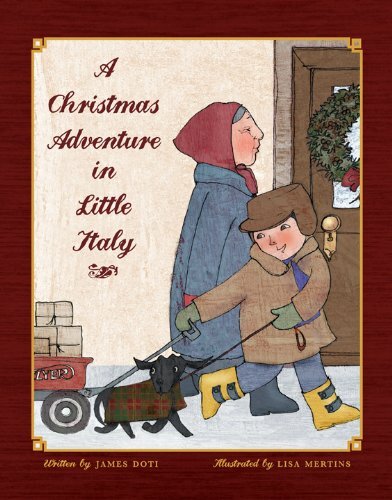 James Doti’s A Christmas Adventure in Little Italy is a heartwarming tale of a boy and his dog, set against the backdrop of a 1950s-era Italian neighborhood. The evocative images and child-friendly narrator’s voice will enchant young readers (and listeners), transporting them to a time gone by.